Be a part of Making Space for Culture! 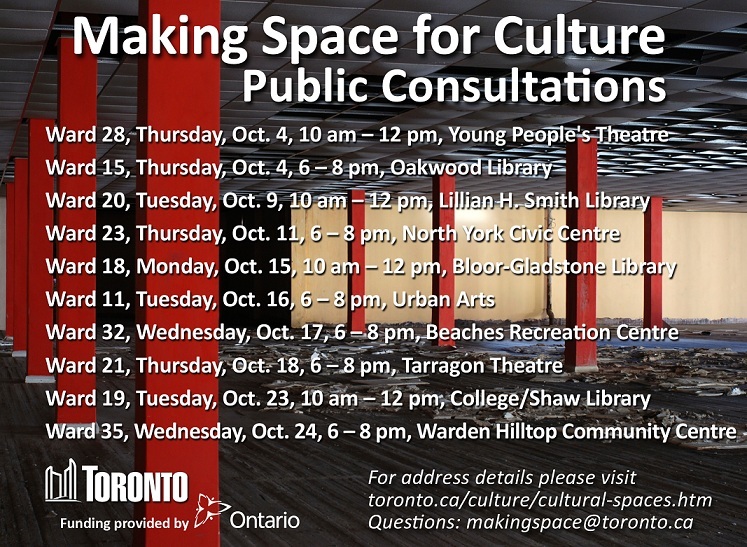 City of Toronto Cultural Services launches another round of ward consultations starting October 4 and running throughout the month. What kind of space does your neighbourhood need to make art, music, dance? To film, play, practice and perform? We’re coming to your neighbourhood to hear your thoughts. We want to know what’s needed, who needs it, and how we might work together to help make space for culture in your community. More information regarding the consultation schedules can be found here, and the complete schedule is attached. We encourage you to attend a consultation in your ward, and be sure to pass it through your networks! Have your voice heard by taking our survey! Making Space for Culture is a major recommendation of the Creative Capital Gains report, unanimously adopted by Toronto City Council in May 2011. Finding, building, and sustaining cultural space requires partners from all sectors, private, non-profit, and government. In order to make wise, long-term plans, Toronto Cultural Services has embarked on a ward-by-ward consultation and planning process to determine local priorities. This entry was posted in Events, Ideas, Research, Spaces and tagged City of Toronto, culture, making space for culture by Neighbourhood Arts Network. Bookmark the permalink.